Pluto is the foremost member of a large population of mysterious icy bodies – called Kuiper Belt Objects – that reside far beyond the orbit of Neptune. In the 1970s and 1980s, Voyagers 1 and 2 explored the gas giant planets (Jupiter, Saturn, Uranus and Neptune) and their intricate systems of rings and moons, but Pluto was out of reach for a visit by either spacecraft. 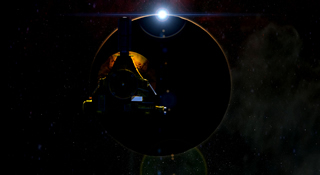 New Horizons will fill this missing chapter in space exploration during its close encounter the planet and its five known moons in July 2015. In one key New Horizons observation, Pluto’s atmosphere will cause a phase shift in radio signals traveling from Earth to the spacecraft. These measurements will accurately reveal the temperature structure in Pluto’s lower atmosphere and the pressure at Pluto’s surface, which are currently uncertain. During this reconnaissance of the Pluto system, we will use the radio equipment onboard New Horizons to perform scientific investigations. In one key observation, Pluto’s atmosphere will cause a phase shift in centimeter-wavelength radio signals traveling from Earth to New Horizons. Precise measurements of this effect will reveal the temperature structure in Pluto’s lower atmosphere and the pressure at Pluto’s surface, both of which are now only poorly known. This type of observation – called a radio occultation – has been applied to the study of all the closer planets. For example, it led to Voyager 1’s discovery that the surface pressure on Saturn’s moon Titan is 50-percent larger than the pressure at sea level on Earth! In the same way, Voyager 2 first measured the surface pressure on Neptune’s moon Triton, where the weight of the atmosphere is 70,000 times less than on Earth. Although surface pressures differ widely on Titan, Earth and Triton, the primary constituent of all three atmospheres is nitrogen. Nitrogen is also known to dominate Pluto’s atmosphere. Such measurements of the similarities and differences among planetary atmospheres offer important clues about the formation and evolution of the solar system. Scientists think Pluto resembles Triton in several respects, such as atmospheric composition and surface pressure. In addition, Pluto has polar caps of nitrogen ice that wax and wane with the seasons, analogous to the carbon dioxide ice caps on Mars. New Horizons will soon be there, and will use its radio equipment to reveal previously unknown properties of Pluto’s atmosphere, enriching our understanding of planetary atmospheres across the solar system. David Hinson, from the SETI Institute and Stanford University, is a co-investigator on the New Horizons Radio Science Experiment (REX) team whose primary responsibility is the success of the radio occultation experiments at Pluto and Charon – a responsibility that includes designing the observations, monitoring the in-flight performance of the radio equipment, and analyzing REX data from the Pluto flyby.